KeVaughn Allen had been ice cold from beyond the arc all night long. That was until the ball was in his hands with the final 8 seconds ticking away and his team down three points. Off-balanced, with a 7-foot monster of a man hovering over him, he let it go. Swoosh. With just 2.7 seconds for Ole Miss to work with, all Florida had to do was keep the Tennessee nightmare from repeating itself. Allen jumped up and stole the inbounds pass before anyone had a chance, sending the game into overtime. Noah Locke has long outgrown his freshman title, and he showed that over and over again on Wednesday night. He drained a triple just 3 seconds into the overtime period, setting the tone for the next 5 minutes. Ole Miss answered with a three of its own, but a couple of nice drives to the basket by Allen and a timely three from Andrew Nembhard made it 86-79. The Rebels brought it back within three points at the 1:37 mark. Allen turned the ball over right after the Gators got it back, but Ole Miss couldn’t take advantage despite getting multiple chances with an offensive rebound. Kevarrius Hayes came through with an offensive board as Allen missed a layup on the other end. Allen missed again on the second chance, but this time he took it into his own hands by diving for the loose ball that was bouncing out of bounds. Somehow, he tipped it into the hands of Hayes, who immediately gave it up to Nembhard to get a higher percentage free throw shooter to the line. Nembhard made both shots to go back up 88-83 with 26 seconds to go. Then, Jalen Hudson was called for a foul on the other end. The Rebels made just one free throw and were down by four. Despite coming up so clutch offensively throughout the night, Allen struggled to keep possession of the ball again on the inbounds play. That gave Ole Miss an easy two points to cut the score to 88-86 with what felt like an eternity (17 seconds) still remaining. But the Rebels had to foul, and they fouled Locke, who finally put the game to rest as he made both attempts with ease. The trio of Allen, Locke and Nembhard scored the final 26 Florida points to secure a 90-86 win at home. Before any overtime heroics happened, the Gators actually struggled with the Rebels for much of the game. Florida trailed for most of the first half, but came back to take a 33-30 lead to the locker room. From the first minutes of the game when Nembhard found him for a dunk on a fast break, it was the Keyontae Johnson show. He scored half of Florida’s points over the first 10 minutes of the second half before the backcourt took over to close things out. Johnson ultimately fouled out in the overtime period, but left the game to a standing ovation from the crowd. Fellow freshman Locke drained threes to give the Gators the lead two different times in the closing minutes of the second half, but the defense just couldn’t keep the Rebels off the board long enough to hold onto it. 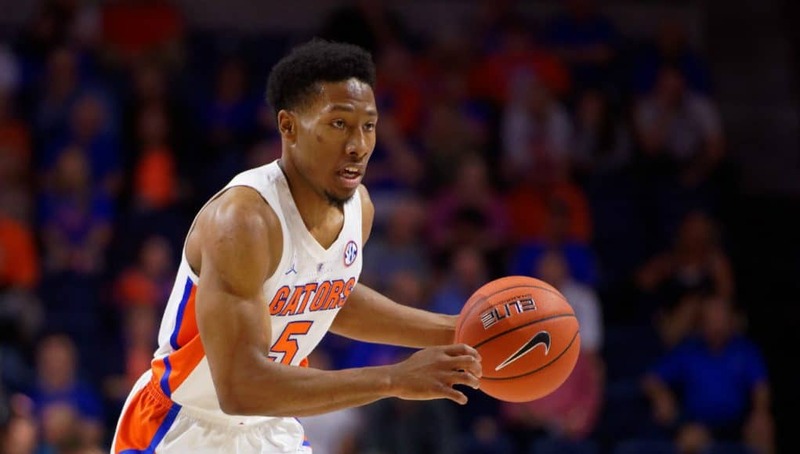 It took the senior Allen stepping up to give the Gators a chance in the end. Originally, White wanted him to drive in for a quick two in those final seconds of regulation, but he changed the call mid-huddle to try to tie it then and there. Allen came through as he has in late-game situations much more recently. He said all he could think about in those pressure situations was assistant coach Jordan Mincy telling him to make winning plays, and that’s what he did. Allen finished right behind Locke with 21 points. He made just 1-of-7 three-point attempts and was 6-for-19 from the field, but really shined at the free throw line as he made all 8 of his attempts. Locke led the team with 22 as he was 7-for-13 from the field, with six of those makes coming from three-point range. Johnson had 15 points (7-for-11) and 6 rebounds, Nembhard had 12 points and dished 6 assists and Hayes finished with 9 points and 8 boards. 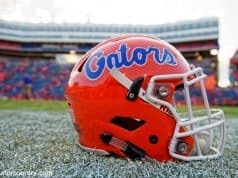 The Gators needed the nice offensive showing with a less than stellar defensive performance in the game. 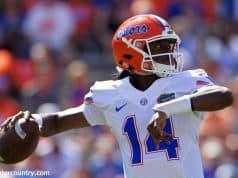 Ole Miss outrebounded Florida 41-27 and had better numbers in almost every statistical category, but still the Gators managed to pull out a win. It will be a bit harder to overcome lapses next game with Kentucky coming to town. 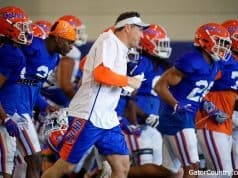 If Florida can steal one from the Wildcats on Saturday, the struggles of last week will be in the rearview.